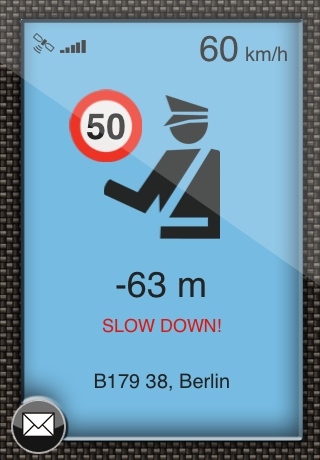 SpeedCam Germany detects and reports the position of more than 4000 speed traps and traffic-light cameras in Germany. Radars Germany will inform you of the proximity of a speed trap, indicating the distance, the street name and the speed limit. You can view the speed trap position on a map, and you can notify to us new control points. Radars Germany works with iPhone 3G and does not require an internet connection to work: the connection is required only to show the map and if you want to signal to us new locations. SpeedCam Germany works with iPhone 3G.